Republican lawmakers were going for their annual retreat to West Virginia. Washington: A train carrying Republican lawmakers to a retreat in West Virginia collided with a garbage truck Wednesday, killing one person and sending a congressman to hospital, officials said. The truck was carrying three people, one of whom was killed and another seriously injured, Senator Bill Cassidy, a licensed physician who helped attend to the injured, said on Twitter. Train operator Amtrak said in a statement that there were "no reported injuries to passengers or crew members" on the train, and that local law enforcement was investigating the scene in Crozet, Virginia. But the office of Jason Lewis, a first-term congressman from Minnesota, confirmed to AFP that the House Republican was taken to hospital to be checked for a concussion. "Due to the impact of the collision and per standard concussion protocol, Lewis is going to be checked out at a local hospital," a Republican aide said. Some members of Congress who are doctors tended to the injured until emergency responders arrived. "There were 3 people in the truck that was straddling the track and which the train hit. One is dead" and another has serious injuries, Cassidy tweeted. "Laura & I & multiple other physicians tended to the patients until EMTs showed up," the senator said, referring to his wife and emergency medical technicians. Shortly after the accident, Paul Ryan's office said the Republican speaker of the House was "fine." Vice President Mike Pence -- the keynote speaker at the three-day retreat west of the US capital -- was to fly in later in the day, and was not on the train. 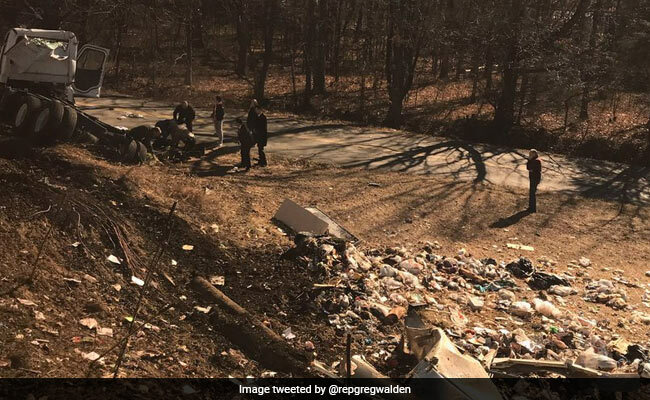 House Republican Greg Walden tweeted a photograph of the scene, showing people standing off the train tracks next to a badly damaged truck, with debris strewn on the ground. Another lawmaker, congressman Jeff Denham, tweeted a photograph of the mangled front of the Amtrak train. "Congressional officials, including the United States Capitol Police, are on the scene and are working closely with partner law enforcement agencies in response to the incident," the USCP said in a statement. Senator Jeff Flake described a chaotic scene along the train tracks, where he said he helped transport a badly injured man away from the truck, and watched emergency responders try but fail to revive the person who died. The incident was a reminder for Flake of the trauma of a shooting last year at a congressional baseball game practice, where he and several other lawmakers saw their colleague Steve Scalise shot and gravely wounded by a gunman. "We've been through this before," Flake said. Republican members of the House of Representatives and the Senate left Washington earlier Wednesday, the morning after Trump delivered his maiden State of the Union speech before Congress. They were bound for the historic Greenbrier resort in White Sulphur Springs, West Virginia, for their annual retreat. Several lawmakers suggested the Republican retreat is now up in the air. The House's top Democrat, Nancy Pelosi, said she was "praying that all are well both on the train and off."